A few months ago, I posted a short clip of myself running hills and skipping rope in boots. In the time since, I’ve received a plethora of questions and comments about the video, so perhaps a short entry is warranted. When I posted the clip, I wasn’t suggesting that everyone abandon their running shoes in place of boots. I was simply demonstrating something that I’ve done on occasion for many years. I didn’t invent the concept though. Many great fighters ran in boots to increase the challenge to the lower body. 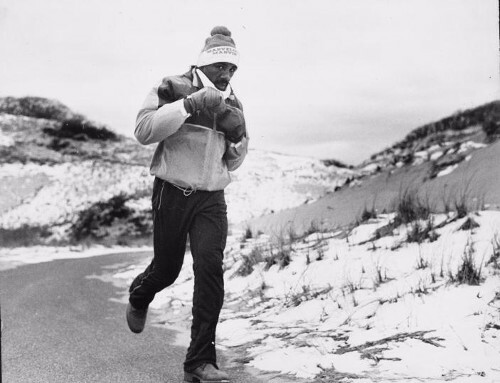 As for examples, former world champion Marvin Hagler was one of my early inspirations (pictured above). Before I elaborate on why I occasionally train in boots, here’s the brief video that I referenced before. As you’ll see, it’s not much different from many of the conditioning videos that I’ve shared in the past. The only difference are the steel toe boots that I’m wearing. My reasoning for occasionally running and skipping in boots is simple. To put it bluntly, it’s tough and I enjoy the challenge. I don’t need science to confirm that my legs are exhausted after performing the work. The fatigue that my legs experience comes on faster and more significantly when compared to performing the same work in running shoes. Running in boots also helps to prepare me for the winter. Running in snow is extremely challenging. I’m not only dealing with resistance from the snow, but also the heavier boot. Training in boots during the warmer months helps keep my legs conditioned for the tougher runs that I experience each winter. An example can be seen below. A few people asked if I was running in boots with hopes of improving my running speed. The answer is no. Running in boots has nothing to do with speed. Personally, I’m not concerned about running speed. I’m not a runner. If I was, I probably wouldn’t run in boots. As a boxing coach, running speed is one of the last things on my mind. I’m more concerned with effort. For example, you might not move as fast with boots, but as long as you’re pushing yourself, you will benefit from the work. Your legs will be challenged in a way that feels similar to what’s experienced when the legs fatigue inside the ring. Anyone who has ever boxed knows the feeling of heavy legs in the later rounds. Training in boots can help condition the legs for those times. Even as a coach, I find boot training beneficial. I’m often holding pads for one fighter after another which involves constantly moving around the ring. The added endurance that I receive from these sessions certainly helps in that regard. I also received several questions about how often I train in boots. I don’t have a specific schedule to share however. The best way to describe my boot training frequency would be to say that I wear them occasionally. Some weeks, I may train in boots a few times. Other weeks, I may not wear them at all. Once again, it’s just another tool in my arsenal that I use on occasion when I’m running hill sprints or skipping rope. As for what boots to wear, my prerequisites are quite simple. I want something that’s comfortable and waterproof. I don’t have a single brand that I swear by though. In the video above, I’m wearing a Timberland boot, but I’ve used many brands over the years and honestly can’t tell the difference between most. As long as the boots are comfortable and can be waterproofed with a spray , they will do the job. In summary, I hope this brief entry helps to clarify my position on training in boots. I’ll be the first to admit that doing so is not necessary. With that said, I’ve always found such sessions to be quite difficult. Having run hills and skipped rope for so many years, it’s nice to have another way to mix things up and challenge myself (physically and mentally). The post Running and Skipping in Boots appeared first on RossTraining.com.